The Oregon Brewers Festival, coming up next week, is a destination event. It has become so popular that it has spawned a collection of related beer events in the city. Held the last full weekend in July each year, the OBF is the crowning moment in Oregon Craft Beer Month. The event attracts 70,000-80,000 beer fans to Waterfront Park each year, showcasing what fun it is to sample great beer while enjoying views of the Willamette River and the surrounding city. Beer lovers travel from around the world to enjoy the festival. The OBF has been instrumental in lending credibility to the notion of craft beer. Mayor Sam Adams taps the ceremonial first keg at the 2010 OBF. The history of the OBF is rich. In the early days of the craft beer movement in Portland, the key players discussed the possibility of holding an event to promote their beers. The initial beachhead came in 1987, when Papa Aldos Pizza held a Blues Festival at Waterfront Park. Thinking they would need beer, they approached Portland Brewing about getting involved. Art Larrance, co-founder of Portland Brewing, anticipated a small crowd and planned accordingly. The taps ran continuously, once turned on. Larrance wound up making countless trips between the festival and the brewery to refill spent kegs. In the end, 76 kegs were consumed. As 1988 dawned, Papa Aldos decided the blues festival wasn’t quite the right demographic fit for them. But they had a two-year permit to do an event in Waterfront Park. They turned the permit over to the Blues Association, which wanted to do its festival around the Fourth of July. That left an open, permitted date in late July. Portland Brewing bought the permit from the Blues Association for $500. Larrance then got Widmer and Bridgeport involved. The McMenamins were busy with their own projects and didn’t want to help organize, but said they would bring beers. The first official OBF happened in 1988. There were 13 breweries involved and 30 beers on tap. Logistical issues were rampant. The expected crowd of 5,000 tripled to 15,000. 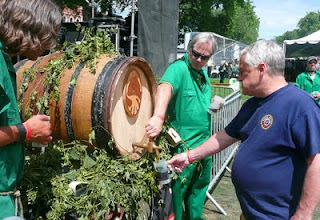 Lucky fans enjoy the ceremonial keg of Deschutes Jubel. Larrance eventually bought out Bridgeport and Widmer changed their involvement. The OBF continued to grow year by year. Larrance never expected the OBF to get as big as it has, although he thought the potential of a large event focused on beer was good. 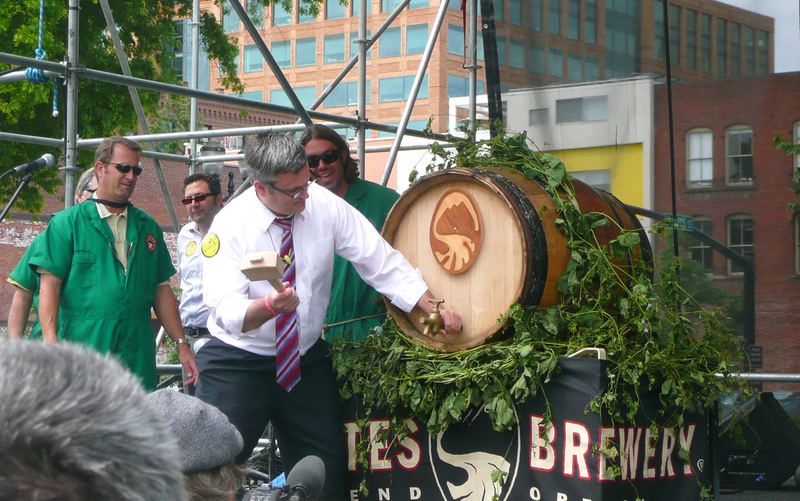 The 2011 Festival will serve up 86 beers and is expected to attract 80,000 beer fans to Portland. It is the quintessential event of the summer.